It’s no secret that I love my car. It’s been extremely dependable, has treated me very well, has a good personality and an adventurous attitude, and doesn’t ask for much (it’s a 2000 Chrysler Neon, and yes, I mean Chrysler). I’ve had it for almost 10 years and put over 100,000 miles on it myself in addition to the 20,000 that were on it when I got it used. If I were to get another car, I’d look for something exactly like the one I have. But once in a great while it will have small issues. Once a wiring harness broke loose and cause the rear lights to go out. Other than that, it’s worked very well and could probably go for another hundred thousand miles without problem. About a week ago I put my key in the door to unlock it and found that it turned freely. I had to unlock the passenger side and then unlock the driver side from the inside. For a few days I drove around without locking the door. Monday I finally got an opportunity to examine the problem. I was able to disassemble the door relatively easily. It was fairly straightforward except for the part where the window handle was connected, but I managed to find the service manual online and pop the handle off. Then I could get in to the lock mechanism and see where the problem was. It didn’t take long to discover the problem. The rod that connects the lock mechanism to the key had slipped off. The piece that held it on was missing. Figuring it was probably at the bottom of the door frame, I felt around and identified it. Yep, there was the problem. That piece should be symmetrical. The piece that had broken was about 2 millimeters wide and because of that the thing slipped off the lock and was no longer holding the rod in place. It didn’t take much jostling for the rod to fall out. I didn’t have any parts exactly like that, and I was up to the challenge of fixing it with parts that I had around the house. 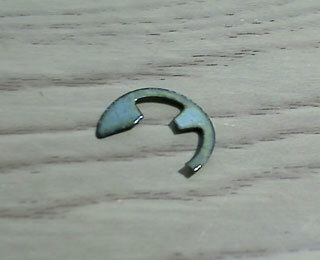 I made a crude washer out of a piece of scrap tin from a can. Then I made a springy curl of stiff wire that would take the place of the part that broke. I installed onto the lock mechanism and played with it a little to make sure it was stuck pretty well. I tried to take it off to adjust it a little, but couldn’t even get it off without some serious effort, so I just left it on there. I tested it thoroughly before putting the door back together. With the door completely reassembled, I tested it out some more, and it worked exactly like it had originally worked. I’m kind of glad that my car is mostly mechanical and doesn’t have a lot of electronic parts. Electronic locks or windows would have made this a much more difficult operation. I’m also happy that I was able to build the parts that I needed from scratch and basic tools. Plus, I always enjoy doing things with my hands and seeing the results and saving money in the process.